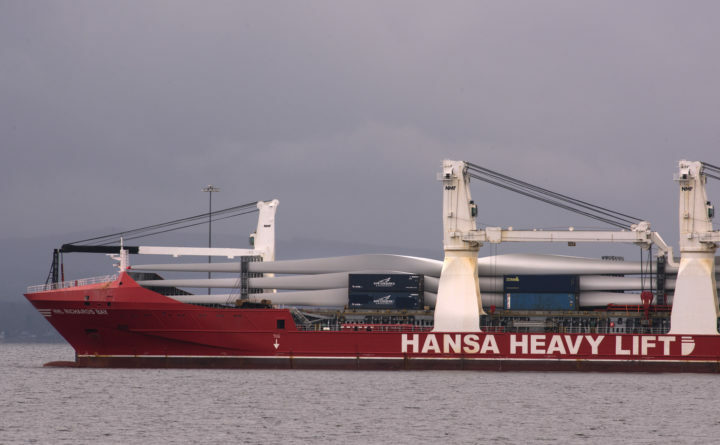 Blades for windmills arrive on a cargo ship to the Sprague Energy terminal in Searsport in this 2016 file photo. The Maine Ocean School, a public magnet high school, expects a fall launch in Searsport for the 2018-19 academic year. A Maine high school aimed at pumping out future ship captains, oceanographers, marine biologists and other seaworthy professionals is close to picking its first crop of students. The Maine Ocean School expects a fall launch in Searsport for the 2018-19 academic year. “There’s a lot of things in the air right now,” said Eric Jergenson, an assistant professor at Maine Maritime Academy who serves as chairman of Maine Ocean School’s board. Among the big items to check off will be hiring the school’s director. The board has been fielding applications, but needs to complete human relations training before it can review the candidates, a process that should start in the next couple of weeks, Jergenson said. They’ll also need to find an administrative assistant. Once those positions are filled, the search for teachers and other staff will start. Representatives of the school have been setting up booths at boat shows and other public events in a push to drum up interest. They also hosted summer day programs, taking groups of prospective students out on schooner trips, toured the Mack Point port facility in Searsport, and visited Penobscot Marine Museum. They expect to have similar excursions this summer. “We are first and foremost interested in knowing the students are interested in the mission and ocean focus of the school,” Jergenson said in explaining what qualities they looked for in students. The school will include courses in required content areas — such as math, English, arts and world languages — but those programs will sometimes feature maritime twists. Students can specialize in programs focused on engineering, transportation, marine sciences or management. The board expects to cap enrollment at 30 in the school’s first year, adding more slots and expanding course offerings in future years. Jergenson said organizers hope the school grows to have more than 100 students, but that could be several years down the road. It’s not yet clear where the school will be located, but organizers have pitched the idea of holding classes in an underused wing of Searsport District Middle and High School, but the arrangement is still being ironed out, according to Jergenson. Offices likely will be set up elsewhere in town. “The setup of the school will be campuslike, spread across Searsport,” Jergenson said. Organizers say the Penobscot Bay town is an ideal location because of its proximity to a seaport, marine museum, and several colleges and universities with strong maritime programs. For now, the school will rely on local families willing to host students who can’t commute. Eventually, it plans to open student dormitories. As a public magnet school, Maine Ocean School will be funded through a state reimbursement for a portion of the cost of each student the school educates. A nonprofit foundation will be responsible for raising the rest of the money needed to support the school. Limestone’s Maine School of Science and Mathematics is the state’s only other public magnet.